Scans long documents up to 200"
A unified software platform that dramatically transforms and simplifies the business critical First Mile™ of business. Leverage the world's first unified smart process development and deployment platform. 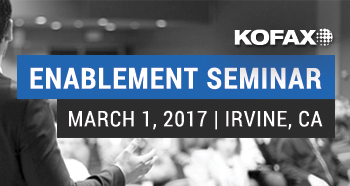 Join us for a full day of education focused on sales enablement specific to the core technologies of Kofax. Our goal is for you to leave the training understanding the best way to pitch and sell Kofax product portfolio, and also how to best leverage our teams to assist you in doing so.